The Dodge Ram 1500 is a poplular truck and one of the most popular questions we get are about fitment. Questions like: "Will the custom truck rims fit like the stock wheels?" or "How much will the wheels stick out past the fenders?". This article will outline and show how certain size wheels and offsets fit on a 2011-2017 Ram 1500 truck. 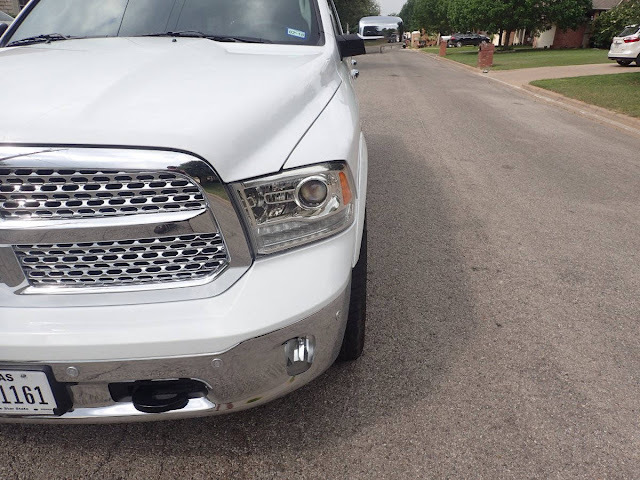 The factory OEM (Original Equipment Manufacturer) wheels for the Dodge Ram 1500 will have a wheel offset between +15mm and +25mm depending on which trim package and wheel option you have. These wheels will tuck under the fender with room to spare. If you want your new wheels to fit like the stock wheels then you will want to search for 8" width wheels with the +15mm to +25mm offset or a 9" wheel with a +18mm offset. 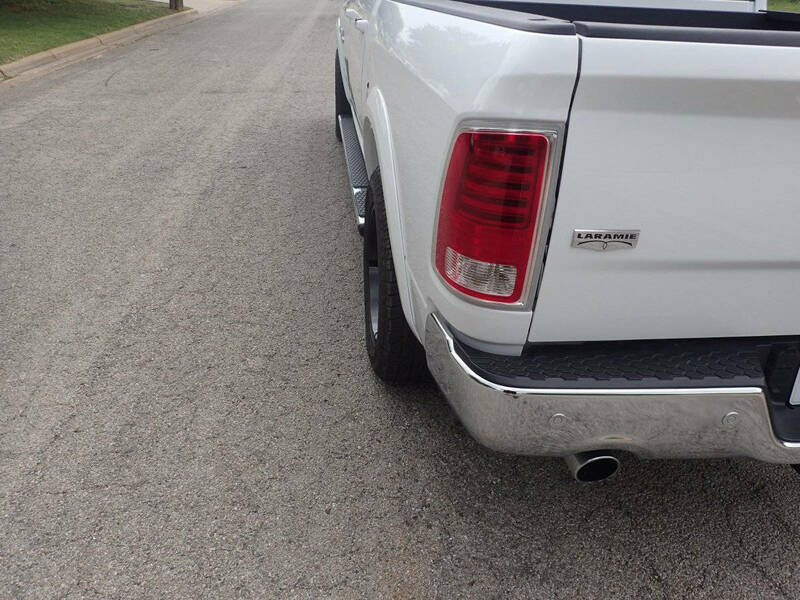 These sizes will stay tucked under the fender with room to spare on the 2011-Up Ram 1500, even if you don't have fender flares. Here is a picture of a 2016 Ram 1500 with 20x9 +18mm offset wheels. You can see from the picture (especially on the rear) that the wheel and tire tuck under the fender. A 20x9 rim with +20mm offset would fit the same. If you are looking for a fit that is more flush with the fenders then search for wheels that are 9" wide with a 0mm or +1mm offset. This will make a flush fit especially if you have factory style fender flares. 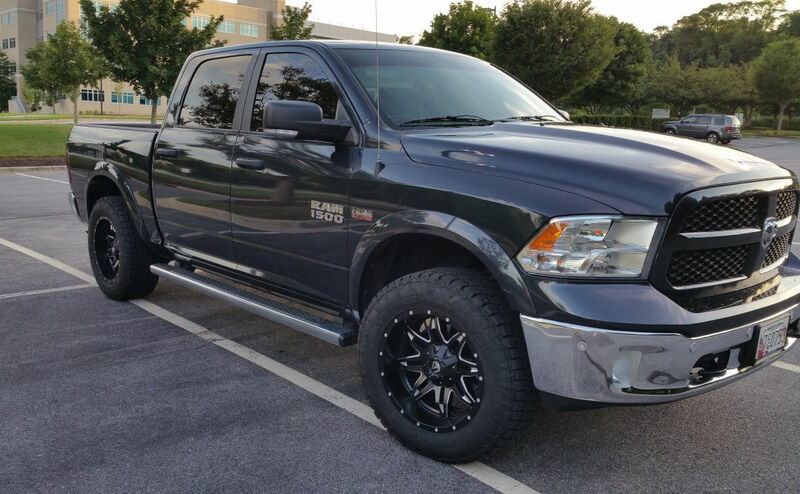 Below is a picture of a 2015 Ram 1500 running 33" tall tires (275/60R20) and 20x9 wheels with a 0mm offset. The wheels and tires fit nicely flush with no rubbing at full turn. With a 2.5" leveling kit a 35" tall tire will work and clear without rubbing. If you are looking for a fit that allows the wheels to stick out past the fenders slightly, then you will want to search for a 20x10 with 5.0" backspace which is a -12mm offset. A 20x10 -12mm will stick out past the fender approximately 1" assuming you have fender flares. If you want the wheels to stick out a little more then search for a 20x10 with a -24mm offset. A 20x10 -24mm offset will stick out past the fenders approximately 1.5" again assuming you have fender flares. 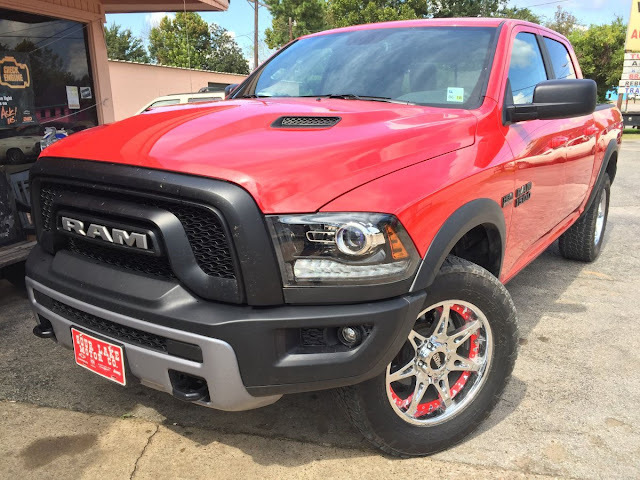 2014 Dodge Ram 1500 with 20x10 wheels with -12mm offset. The 20x10 truck rims with a 33" tall tire will require the truck to be leveled to alleviate any tire rub. If you plan on running taller than 33" tires with 20x10 wheels then a lift kit is recommended.